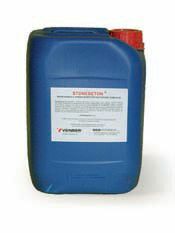 Super-consolidating product for scrumbling screeds; it deeply penetretas the substrate and progressively improves its general characteristics. It must be applied on uncoherent screeds in order to consolidate them, to force up their mechanical properties and stop their crumbling. One-component, ready to use product water-based.